Imaginative author Robert Louis Stevenson wrote in his 1884 essay, A Penny Plain and Twopence Coloured, “If you love art, folly, or the bright eyes of children, speed to Pollock’s…” The toy theatre was a beloved pastime in 19th-century England that appealed to the creativity and craftsmanship of children and adults. Benjamin Pollock inherited his father-in-law’s toyshop in 1877, where he printed and sold engraved and etched prints of theatre characters and scenes. It was common practice for theatre publishers and shops to send multiple artists to the opening of new productions, where they would quickly sketch the actors, scenery and backdrops. The draftsmen would then turn over their drawings to the printer, who prepared illustrated sheets depicting the play and a tiny booklet of the script. As the title of Stevenson’s essay reveals, these prints were known as “penny plain” and “twopence coloured” for they were sold as either uncolored or hand-colored and priced accordingly. Young hobbyists would paint and cut the illustrations and then mount them onto wood to create a miniature, movable stage. These three-dimensional novelties captivated users and revived the spirit and stagecraft of 19th century British theatre. 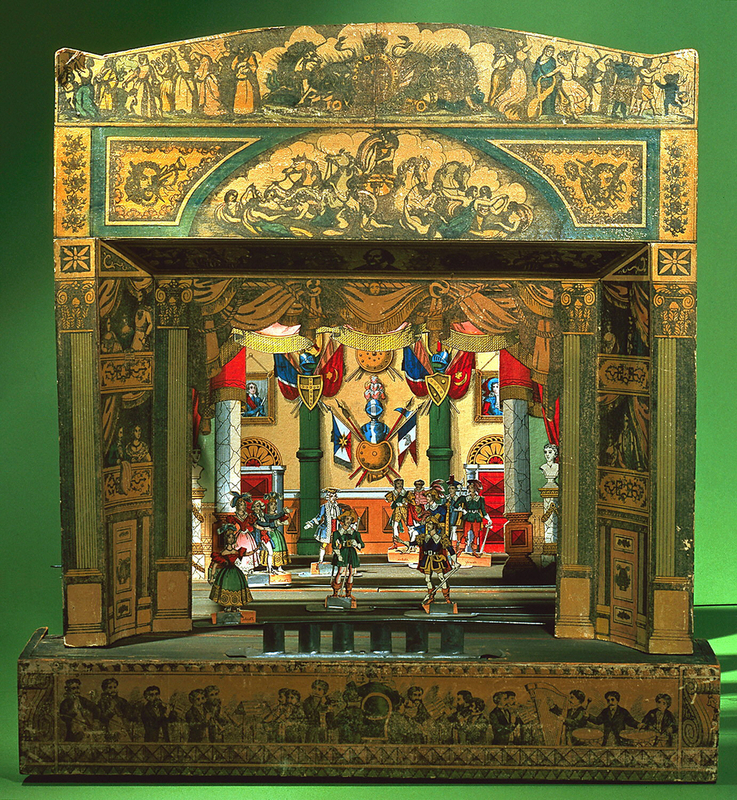 The toy theatre in Cooper Hewitt’s collection is a small yet elaborate structure: it is only about 16 inches tall and 19 inches wide. The wooden stage, painted green and gold, is covered in images of a theatre orchestra with seated spectators in the wings. The scene within is from Cinderella: miniature actors, dressed in formal garments, stand in a palace hall that is hung with panoplies of armor and red curtains. The figures are placed at varying depths, creating a lively, immersive setting. Each scene from Cinderella includes several intricate, printed components, and many of Pollock’s individual prints are in the Cooper Hewitt’s collection. Garrett Epps, “The Rise and Fall of Toy Theatre,” Craftsmanship Magazine, December 6, 2015, accessed November 10, 2016, http://craftsmanship.net/the-rise-and-fall-of-toy-theatre/. Louise Heard, “About Us,” Benjamin Pollock’s Toyshop, accessed November 10, 2016, http://www.pollocks-coventgarden.co.uk/index.php/about-us/.